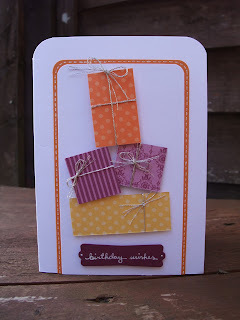 Second of my card instalments in an attempt to catch up on the last week or so! I hope you enjoy seeing all the things I have been making! Please feel free to leave a comment, I love reading them! A really quick easy card. 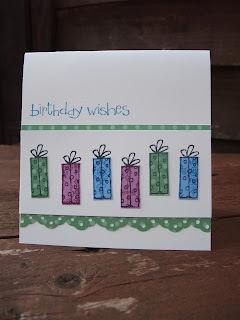 I stamped the presents on Whisper White CS and then stamped again onto Designer Series Paper and cut them out. I punched some Wild Wasabi DSP with the punch and adhered it to the bottom with a narrow strip along the top. I adhered all that to the white background and finally stamped the sentiment above the presents. I wanted to try using DSP to make presents. I saw a card similar to this on the wonderful Kristina Werner's website, unfortunately I dont think it turned out as nicely as hers did. At least I tried! Let me know what you think! 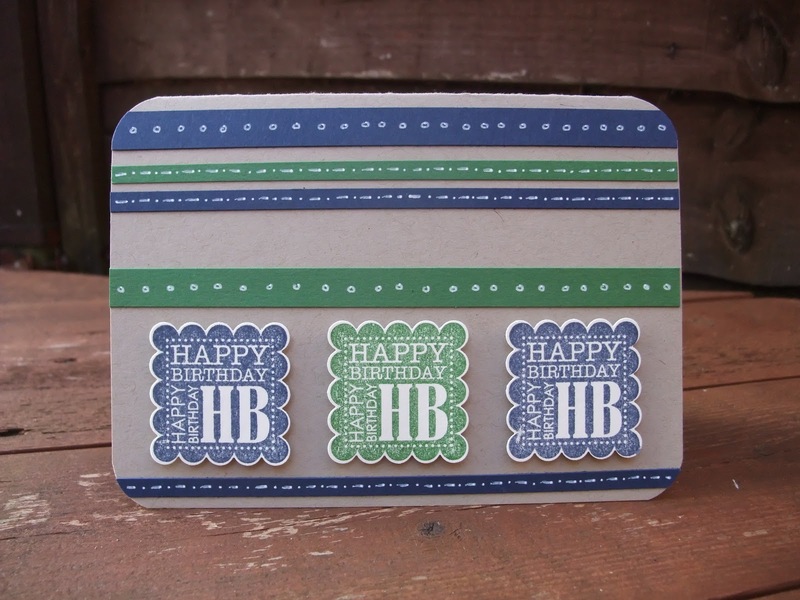 I cut strips in a variety of widths of cardstock, and adhered them to the card, adding the scallop punched saying HB in a row too. 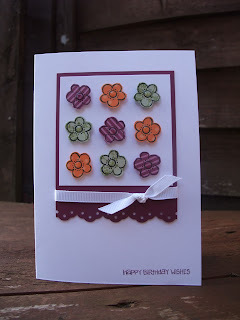 I finished off the card by doing some dots and dashes with a white gel pen on the card strips and rounding the corners. This is a good manly card! 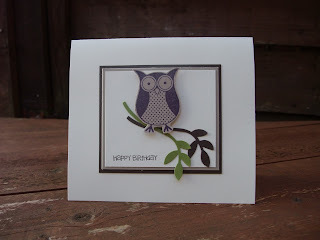 I punched out the leaves and branches using the Two Step Bird punch and then stamped the owl onto Crumb Cake and Cut it out. I adhered it all together and popped the owl up on some dimensionals to add some depth. 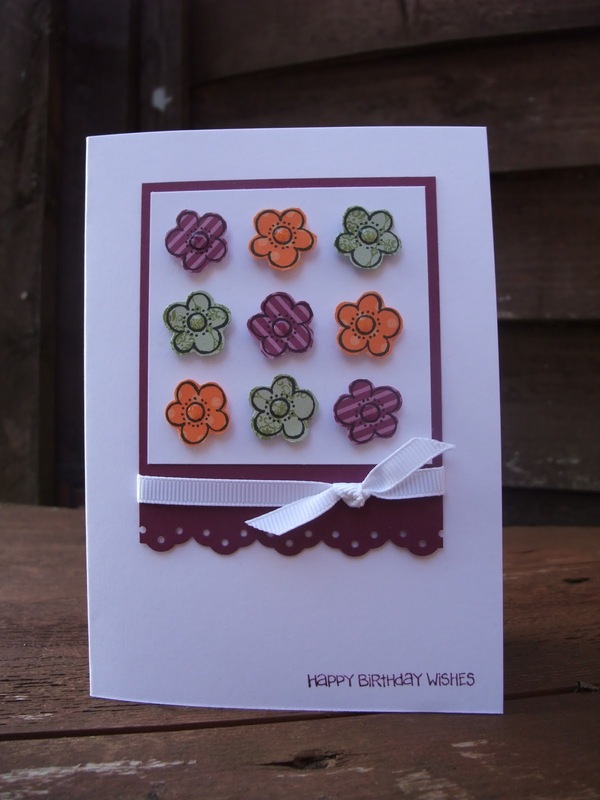 I simply stamped the flower from Every Little Bit onto some DSP and then cut them out, adding dimensionals to the back and adhereing them in a grid pattern to the Whisper White cardstock, which I adhered to Rich Razzleberry cardstock that had a punched bottom edge on. I added some Whisper White grosgrain ribbon to help finish it off and a small blob of crystal effects to the centre of each flower to give it a glossy finish! Finally I stamped the sentiment in the bottom right hand corner! 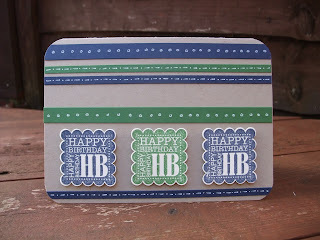 I stamped the flourish onto Crumb Cake in versamark ink and then added clear embossing powder. 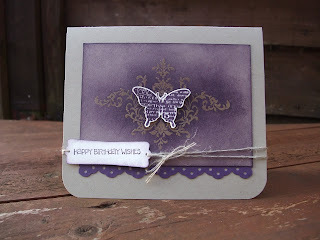 I then sponged Elegant Eggplant ink over the cardstock to create this spongy purple and kraft coloured effect. I stamped the butterfly, cut it out and folded the wings up to add dimension. I attached it with a glue dot. I punched the eyelet border and adhered the card together. Finally I stamped and punched out the sentiment, pierced a whole in each side and attached it to the card by wrapping linen thread around the card. I hope you enjoyed my second update, check back later for my third update! These are fantastic, the one with the owl is adorable!